Upress Review 2019: Is Upress a Good Hosting? uPress is a leading web hosting company in Israel. It operates five data centers worldwide and provides managed WordPress hosting services in addition to VPS to over 30,000 customers. uPress is a managed hosting service that provides feature-rich hosting packages to WordPress users. With their shared or managed VPS, you get peak performance and security at a price that competitors can’t match. uPress maintains high-grade servers in a number of server locations. You can host your website or emails in data centers located in Israel, Europe, or the USA. Their SSD enterprise servers are designed for peak performance. With 99.9% network and uptime SLAs and round the clock protection against DDoS attacks, you will never worry about performance or security. Four plans are available. Here’s just a highlight of their features. Personal – Suitable for a simple personal blog or website. With it you get, 1 GB storage space, 50GB monthly traffic, and two website monitors. Professional – Ideal for a growing business. With 3 GB storage and 100 GB bandwidth, it can host up three websites. VPS – Perfect for large companies with heavy workloads or need for dedicated resources. It comes with 40 GB storage space and supports many websites. Five transfers and five monitors are included. Worthy to note is that all the higher level plans come with free SSL certificates, daily backups, SuperCache, CDN, and staging environments with a multisite option. Integrated directly with the control panel is the uPress monitor, which lets you keep track of your website’s performance and health. You can set alerts and receive notifications whenever your site fails or malfunctions. In addition, you get history backups for your databases, files, and mailboxes for 30 days. With a few clicks, you can restore all the important files or emails on your website or mailbox following a crash. uPress doesn’t just give you a suite of features, it also gives you a user-friendly control area to manage your websites, emails, and security among other things. From the admin area, you can select server location, perform security scans, manage users and extensions, set up staging sites, and request support from WordPress experts. It’s convenient for advanced users and easy for beginners. I like the fact that they have multiple versions including English, French, Hebrew, and Portuguese. You shouldn’t have problems getting around with any version. If you’re getting started, I recommend that you watch their tutorial videos and read the FAQs and their knowledge base. Within a day or two of signing up and learning, you should be able to manage your account efficiently like I did. Typical of managed hosting services, uPress is quite expensive compared to popular hosting services such as Godaddy and BlueHost. Though you will pay more to get onboard, you will get quality services, more dedicated resources, and a high level of support. All plans come with a 30-day free trial. They don’t charge set up fees or include VAT in their prices, which is a plus. So you will receive your money’s worth when you sign up with them. With the option to subscribe monthly or annually, uPress lets you pay conveniently via PayPal and credit cards issued by Visa, American Express, or Isracard Ltd. I have nothing but respect and admiration for the courteous and professional support team at uPress. They’re an eclectic team of software developers, network administrators, UI-UX designers, and WordPress experts with years of experience. You can count on them to sort out a range of hosting problems, resolve DNS issues, transfer your website files, or troubleshoot your server. Live operators are available on phone from 8:30 am – 17:00 pm and 24/7 via their ticketing system. You can also reach out to them via email or the online contact form. 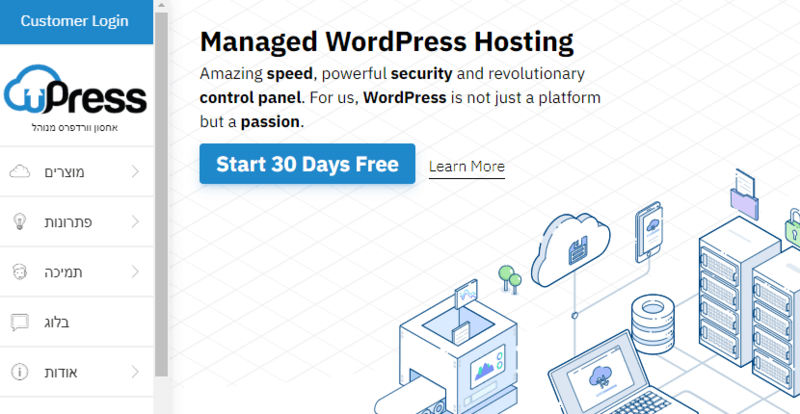 Powered by SSD servers, uPress is a great choice for customers who are looking for fast, secure, and reliable managed WordPress hosting services. They offer a full suite of features and high-level support across all plans. Wondering how Upress stacks up against other Web Hosting companies? Enter any other Web Hosting company and we will give you a side-by-side comparison.